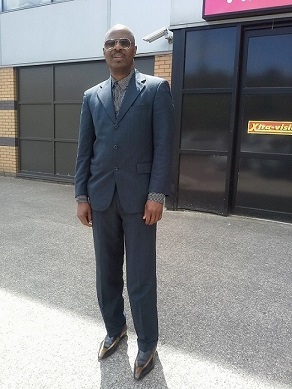 Barnabas Agorh, Nigerian and proud Biafran living, studying and working in Cork. This week’s migrant is Barnabas Agorh. Barnabas is a very active man. He has been in Ireland since 2004, and has received permission to stay this year. Barnabas lived in South korea before moving to Ireland, but found it hard to get permission to stay there. His wife had lived in Cork before, which made it easier for them to get leave to stay. Barnabas is a father of 4. He studies philosophy and theology in the University of Maynooth, and is planning to study law on top of all that. Barnabas, an Igbo, is very anxious to learn law becuase of his involvement in the Biafran cause. He explains us the history of Biafra and the war there. In 1967 his two brothers went to war to protect the republic of Biafra, but they never came back. Barnabas saw his dad being shot to death right before his eyes. All this made him wish for Biafra to finally become a reality. He got involved with the Biafran cause through radio Biafra, but was disappointed with the hate speech that is constantly used on Radio Biafra. He is now setting up Biafra Christian Radio 1, where hate speech is never used. Biafra needs friends, not enemies. Fighting and killing will not help anythging, says Barnabas. He is now involved with the customary government in the Biafran government. The movement is in contact with the UN and with the Nigerian government and is aiming for home rule to start with. Posted in podcasts.Tagged Africa, biafra, Cork, expats, war. Next Post Ini Obong Usanga from Nigeria talks about her forced migration and reproductive abuse.